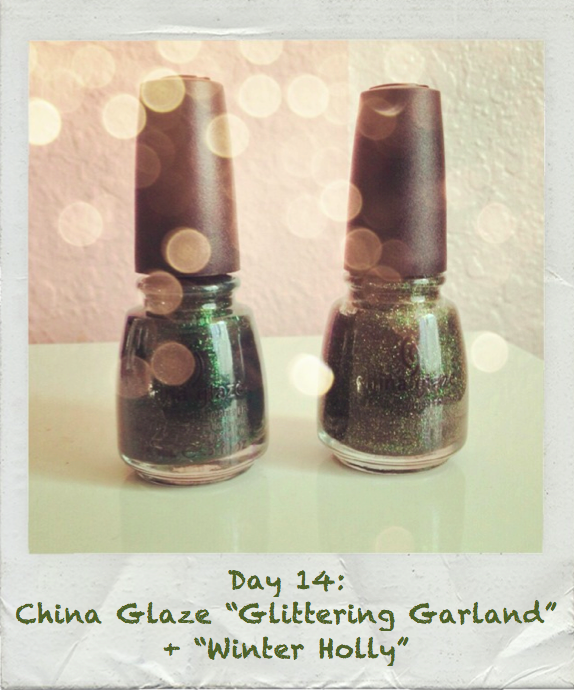 What I Blog About When I Blog About Books: 14th Day of Christmas: China Glaze "Glittering Garland" + China Glaze "Winter Holly"
14th Day of Christmas: China Glaze "Glittering Garland" + China Glaze "Winter Holly"
Time for a green holiday nail of the day! Today nail of the day reminds me of wreaths and Christmas trees. I'll be combining China Glaze's "Glittering Garland" (though any dark green base will do) and China Glaze's "Winter Holly," the star of today's notd. "Winter Holly" is the star of this manicure. 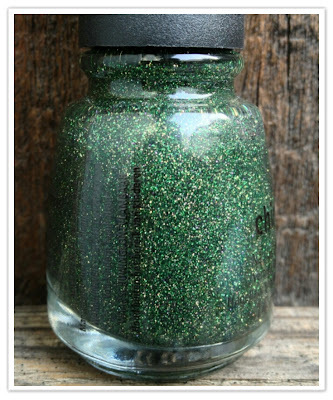 It is a full glitter polish with predominantly forest green glitters and some yellow glitters. The glitters are a fairly fine grade, blending the green and yellow together nicely. WARNING: If you don't put a THICK layer of top coat on this polish, it will look like your nails are growing moss on them. I originally thought I would like the matte affect because it would resemble wreaths more, but it really does look like ugly moss. Alone, this polish is very sheer and requires 3 coats for opacity. Unlike most of the other 25 Days of Christmas Manicures, this was my first time trying this combination. I was very pleasantly surprised! 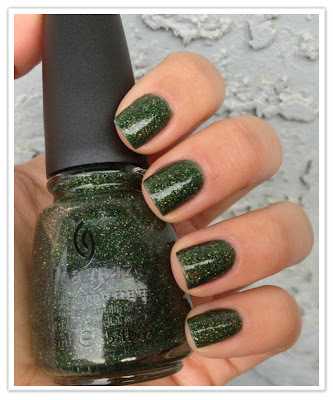 "Winter Holly" is definitely my favorite polish from China Glaze's 2012 Holiday collection! I was very disappointed with this year's collection overall, but "Winter Holly" somewhat makes up for it. As I wear this combination, I continue to feel pleasantly surprised at the small yellow glitters amongst the green. It really adds some complexity to it. Enlarge the photos if you need to. I wouldn't want you to miss the beauty of this polish. Though I love holiday colors of red, golds, and greens, I have always viewed green as the least festive and fun to wear for celebratory purposes, but "Winter Holly" is really changing my opinion of that! I really recommend to take my warning about the necessity of a thick layer of top coat with this polish. The change is like day and night. Nail of the days like today are why I love doing this series. 25 manicures leaves me room to re-wear old favorites, and discover new favorite combinations like this one!